Small kitchen design doesn’t have to be cramped or limited. There are plenty of tricks and techniques to use the space creatively and give the illusion of a bigger area full of life and character. If you want your space to look larger go for a modern, minimalist kitchen. Replace heavy handles with finger pulls or sleek and slim handles. Replace cabinets with drawers and pull outs where possible as they store a lot more. An appliance garage on the counter with a roll-up aluminium door hides clutter and adds interest and texture. Good illumination is key and glossy finishes on the cabinets will also make the room appear lighter and bigger. Always think vertically when designing small spaces. Maximize storage space by installing wall cabinets to the ceiling or use wicker storage baskets between the cabinets and ceiling. A sliding ladder is a practical accessory. Lacquer your ceiling in a color that complements the walls and it will look like the walls extend much higher than they actually do. The color of walls, cabinets, counters, appliances, stools and other décor can change the perceived size of the kitchen. Light shades are best for giving the illusion of open areas. 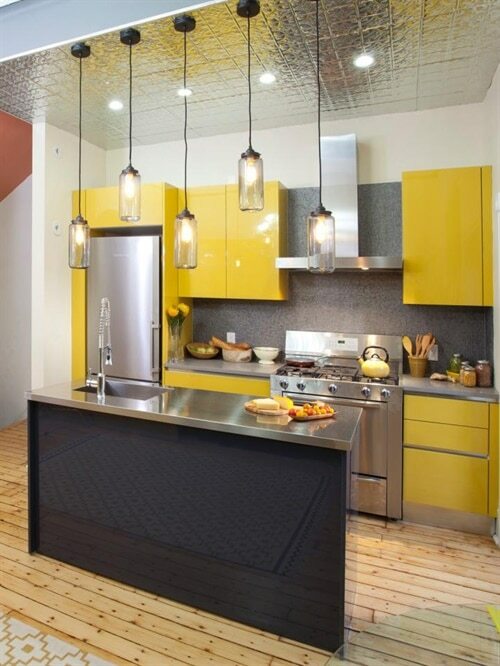 This doesn’t mean a small kitchen has to be white – light greys, cool blues or rich, warm yellows work too. Tile the walls between counter and wall cabinets with subway tiles all round to help make the space feel wider. A bold color or patterned backsplash in an all-white kitchen will also bring life and warmth. Get creative with mirrors and glass. Mirrored glass on cabinet doors instantly enlarges a small kitchen, or use mirrors or highly reflective glass tile for your backsplash. Hang a mirror above your sink. 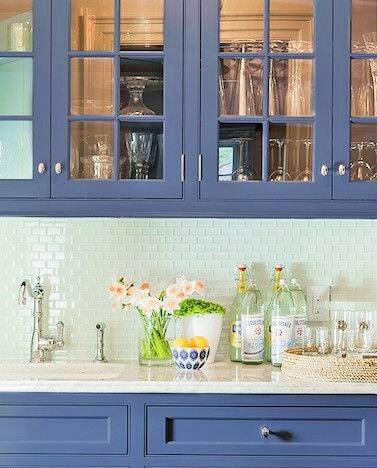 Make a feature of glass door cabinets in a contrasting color. 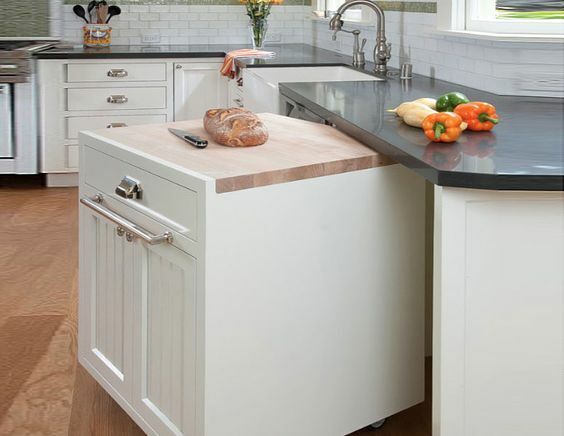 The use of a kitchen island on wheels that can be stored undercounter is invaluable in small kitchens. Make sure it has as much storage as possible – towel racks, cabinets or a storage rack or baskets underneath are a must. Drop-leaf tables are also useful. If you have a peninsula dining counter, opt for low, backless stools that can be stored under the counter and don’t detract visually from the room. Stamp your personality on the room with the use of décor and clever storage hacks. 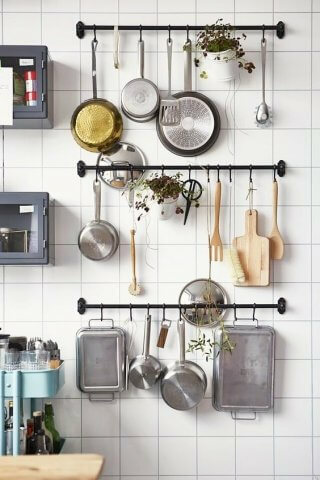 Install an industrial pot rack or hanging rods and baskets – both functional and stylish. Consider open shelving and and magnetic knife or spice holders. Make a feature wall by painting it a bold color with an eye-catching decal. 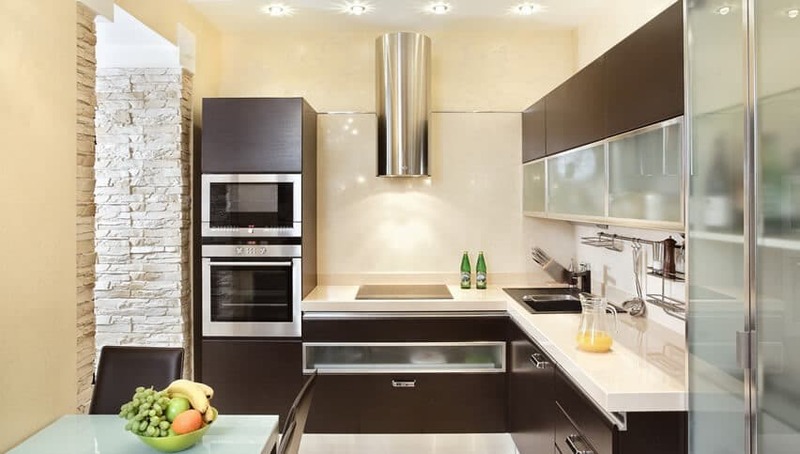 Just because a kitchen is small doesn’t mean that your design cannot be big! Want to transform a small kitchen? Call us now or visit our showroom in Plumstead, Cape Town.